We’re delighted to be working with American artist Hiss Golden Messenger for the first time. 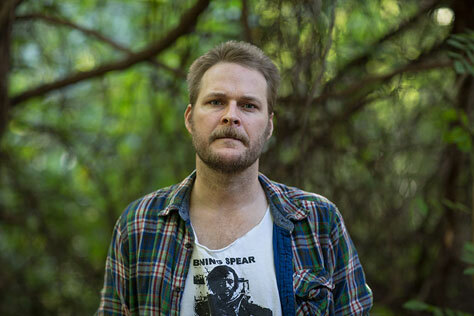 Hiss Golden Messenger is Durham, North Carolina-based songwriter M.C. Taylor and multi-instrumentalist and recordist Scott Hirsch, who lives in Brooklyn, New York. The pair has been making music together for twenty years in various incarnations, including six records with the San Francisco band the Court and Spark. Since 2009, Taylor and Hirsch – in collaboration with longtime drummer Terry Lonergan, Nashville guitarist William Tyler, and members of Megafaun, the Black Twig Pickers, Pelt, D. Charles Speer & the Helix, Brightblack Morning Light – have released a string of universally acclaimed albums as Hiss Golden Messenger: Country Hai East Cotton (2009), Root Work (2010), Bad Debt (2010, soon to be reissued by Paradise of Bachelors), Poor Moon (2011), Hiss Golden Messenger Plays Elephant Micah Plays Hiss Golden Messenger (2012), Lord I Love the Rain (2012) and Haw (2013). Drawing from the deep well of traditional and vernacular Southern song that Taylor has explored and documented as a practicing folklorist, as well as the more alchemical strains of 1970’s country-rock, dub music, and kosmische music, ‘like Van Morrison circa Astral Weeks, Hiss Golden Messenger confounds traditional-music genre expectations’ (according to The Huffington Post.) Distinguished by their fascinatingly ambiguous conjuring of spiritual – and often specifically Biblical – concerns and characters, as well as a taut lyricism informed by writers as disparate as Ronnie Lane, Lew Welch, and Wendell Berry, Taylor’s unabashedly ardent songs rank among the most exquisitely crafted and eloquent of his generation. Their 2011 LP Poor Moon has been hailed as a masterful and moving country-soul statement on faith and family by Pitchfork, Uncut, Salon and many others, leading to profiles of Taylor by NPR, The Oxford American and Interview Magazine. Last year Paradise of Bachelors released HGM’s full-length follow up to Poor Moon, the remarkable, and darker, Haw, which earned glowing reviews from the New York Times, MOJO, The Times, the Washington Post and beyond, becoming one of the year’s most critically lauded recordings. Support comes from acoustic band Thugs On Wolves. From Greater Manchester, Thugs On Wolves are a four-piece band of brothers committed to providing interesting, convention-defying music. With thought-provoking lyrics and genre-spanning influences, expect them to transport you into a sonic wonder-world with their unique hypnagogic timbre. They’re one of the most talented Manchester bands we’ve seen of late.